Yes. Tracking behavior and movement of your visitors using Smartsupp is legal, just like using Google Analytics or other services for tracking visitors on your website. From a legal point of view it’s important if you record personal data of visitors using Smartsupp. This is something you can set up in Smartsupp. On most websites the only place where visitors might fill in personal data are forms. To ensure Smartsupp doesn’t record any personal data, simply disable recording of form inputs in Smartsupp settings. Legal requirements about personal data collection may vary across countries in the world. It’s best to consult a local lawyer in your country if you are unsure about your legal obligations in this area. Should I inform visitors that I record them? Is visitor data safe with Smartsupp? The data of your visitors is safe with Smartsupp. We created several security steps to protect the sensitive data of your visitors. 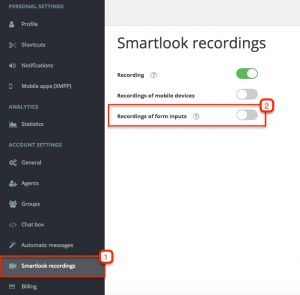 Access to the visitor recordings of your website is possible only after logging into your Smartsupp account. Your account can only be accessed using your login email and password. We recommend using a strong password that can’t be guessed. 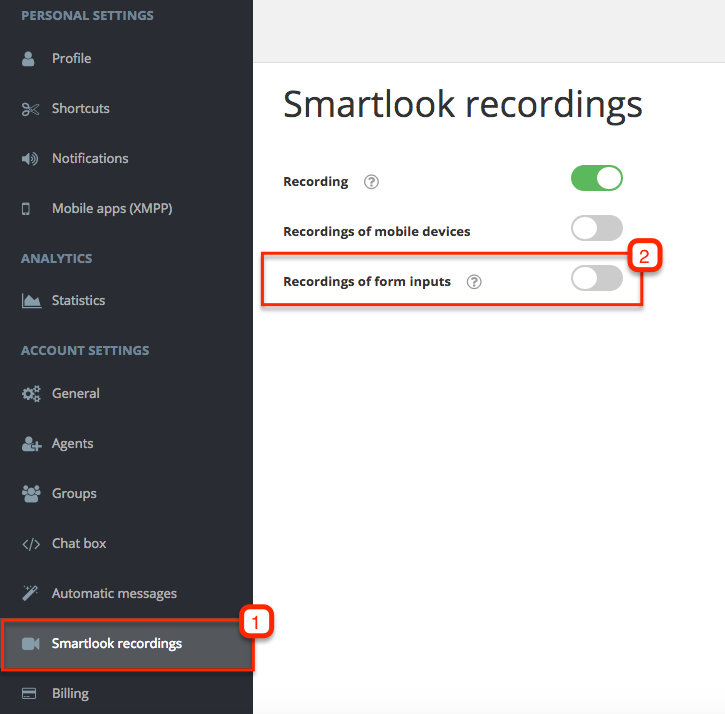 Smartsupp never records form fields marked as sensitive. This means passwords, credit card numbers and other sensitive data are not recorded, even if you do record form inputs. If Smartsupp is recording passwords or credit card numbers on your website, this most likely means your web developers didn’t mark those form fields as sensitive when creating your website. In such a case please contact your web developer to set those form fields as sensitive in the code. Smartsupp is using SSL / TLS encryption (Secure Sockets Layer / Transport Layer Security) and latest security standards to protect your data. You can block any elements of your site from being recorded using our API.